Today, something on the close order of 93 million Americans are out of work. Although the “official” government figure claims that unemployment is less than 6%, that figure deliberately ignores the long-term discouraged who aren’t giving the government evidence of looking for work. A far more accurate picture, using the government’s statistics as organised by the algorithm used back in 1980, shows unemployment running well above 23%. Clearly the Federal Reserve act’s goal of “maximum employment” has not been obtained. A very great deal is very wrong with the work of the Federal Reserve system. Consider, for example, the concentration of wealth. Although politicians like Barack Obama talk frequently about the idea of reducing the concentration of wealth amongst the top one-tenth of one percent, the reality of their political policies is very different. Since 1971, when the USA dollar broke its last connection to gold, wealth concentration has been dramatically exacerbated. Tyler Durden, clearly a pseudonym, over at Zerohedge.com, has commented thoroughly and on several occasions about how the gold standard not only allowed lower income Americans to gain wealth, but also seems to have limited the prosperity of the upper echelon of income earners. I suspect that the timing of the rise in wealth of the latter group coincides with the Reagan era cuts in the top tax rates, since it clearly begins well after his election in 1980. However, his chart on the economic results of eliminating the gold cover clause in 1971 is quite dramatic. As you can see, the 90% of earners from the bottom through the middle-class, saw their income growth stagnate after the change in the convertibility of the dollar to gold in 1971. 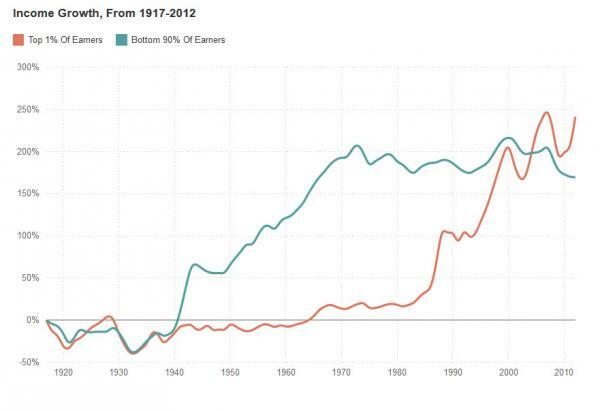 You can also see that neither that change, nor the shift in income tax burdens was bad for the top 1% of earners. 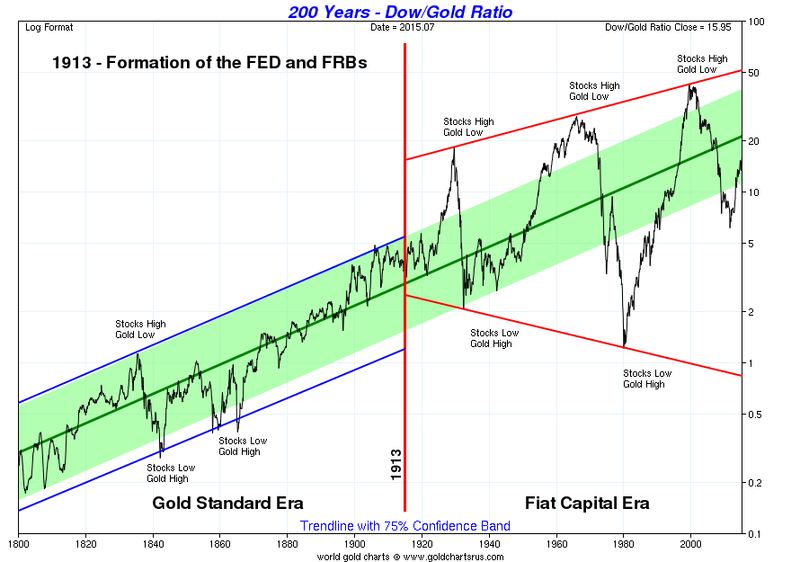 It seems that rather than providing stable value, the Federal Reserve has done just the opposite. Or perhaps we were all “misinformed” about its actual purpose from inception. One of the people who made a thoroughly documented case about the war on gold and its connection to the statist authoritarian shenanigans of Wall Street banking executives was Antony Sutton. People who falsely believe that the leading bankers of the United States have always, or ever, been pillars of support for free markets and individual liberty would do well to read, or at least read reviews of Sutton’s books Wall Street and the Bolshevik Revolution (1974, 1999) (Online version) and Wall Street and the Rise of Hitler (1976, 1999) (Online version). It seems clear that many financiers, notably Jacob Schiff and Prescott Bush, and industrial tycoons such as Armand Hammer had close ties and great affinity with mass murdering psychopaths like Adolph Hitler and Josef Stalin. But if you ask me, Tony Sutton’s masterpiece is The War on Gold: How to Profit from the Gold Crisis (1977). It is a quite excellent history of gold and silver as money going back to ancient times. He notes the origins of paper money in 13th Century China where Marco Polo served as a governor for Kublai Khan, extracting gold, silver, precious gems, and pearls from merchants and forcing them to accept mulberry-bark paper with “official” vermillion ink markings as money. Naturally, the upshot of that particular deal was that, over the next decades, redemptions of the paper money for gold and other materials became less and less frequent, then stopped altogether. Undoubtedly, the peasant populations of Asia have long remembered these events and preferred metal money. Another author who also went to considerable pains to document his research is G. Edward Griffin. His book “The Creature from Jekyll Island” is an excellent resource for people who want to understand why bankers and state power enthusiasts wanted to end the use of gold and silver as money. After all, only deficit spending allows for really big wars, and only after the gold standard was sacked were World Wars One and Two possible, along with the enduring Cold War, and the new and never-ending “War on Terror.” People don’t like to pay taxes, but as long as some talking heads inform them that “the national debt is only money we owe ourselves” they seem to be willing to accept enormous government deficits and the endless wars that debt alone can finance. The argument that government control over interest rates, or the ill-conceived notion that central bankers may be trusted to manipulate interest rates on an official basis, should generate prosperity for everyone is interesting, but clearly has not proven valid. Instead, misery continues to escalate, with poverty becoming worse for tens of millions in the USA and hundreds of millions worldwide. If the central bankers could have gotten us out of the mess of the global financial crisis, they certainly would have done so by now. Here is considerable evidence that the economy has not recovered in meaningful ways, such as poverty among children. David Stockman has accumulated a detailed argument strongly indicating that central bankers cannot do anything more with their zero interest rate policies to “stimulate” a dead, or living dead zombie, economy. Since the 1913 Federal Reserve act, central banking has become very popular worldwide. Many of the major nations have central bank institutions, there is a Bank for International Settlements, an International Monetary Fund, and, since 2000, a European Central Bank. National central banks and these other international groups attempt to manage interest rates, help national governments finance enormous military expenditures, and, at times, force national governments to make debt re-payment concessions. We’ve seen in recent weeks that Greek debt has become unmanageable. Rather than accept their losses, the commercial banks which lent much money to Greece years ago arranged to get their loans nationalised and super-nationalised by the governments of Germany, the European Union, the International Monetary Fund. Naturally, those powers seem determined to force Greece to capitulate, whether or not they destroy Greek lives, motivate insurrection, or bring down the current government. If anarchy were to replace the existing government of Greece, I wouldn’t mind a bit, but I suspect the powers that be in Germany and the EU would insist on a different, more fascist or at least more authoritarian outcome. One of the clearest arguments against the market manipulations of the interest-rate-setting Federal Reserve is the evident exacerbation of volatility in stock markets. Rather than creating stable prices and sustained growth, the Federal Reserve has forced the world onto a wild roller-coaster of booms and busts. Here is a simple chart showing the Dow Jones Industrials priced in gold. As you can see, things were actually better, in terms of the stock market boom-bust cycles prior to the creation of the Federal Reserve. But, wait, you say. You thought that events like the Panic of 1907 motivated politicians like senator Nelson Aldrich (father-in-law of John D. Rockefeller, Jr.) to examine the boom-bust cycle and implement solutions like the Federal Reserve. You were told that the Federal Reserve was meant to reduce the volatility of the boom-bust cycle, not exacerbate it. Perhaps you were…misinformed. If central banks do not make people generally more prosperous, do not stabilise prices, do not maximise employment, do not reduce the extremes of the boom-bust business cycles, do not and cannot create stable money, then what do they actually do? They clearly interfere with international markets, since interest rate changes are an excellent predictor of price changes in commodities, stocks, and bonds – but only central bankers can know what interest rates are about to do. In the particular case of gold, the central bankers, the regulators of financial markets, and certain enormous banks seem to be effective at creating paper gold and manipulating the price of gold at least, and probably silver and other precious metals. But, what they seem to be best at, what bankers seem to get out of the central banking infestation, is consolidation of the banking industry. In 1913, there were 27,285 banks in the United States, serving a population of 97,225,000. Today, a population over three times as large, about 325 million, is served by fewer than 7,000 banks. According to the annual report of the Dallas Federal Reserve in 2011, the banking industry had already been consolidated to about 12,600 banks in 1970. At that point in time, the five largest banks in the United States held only 17% of the total financial assets in the country, with a healthy third of assets held by 95 medium-sized banks and almost half of financial assets held by the 12,500 smaller banks. 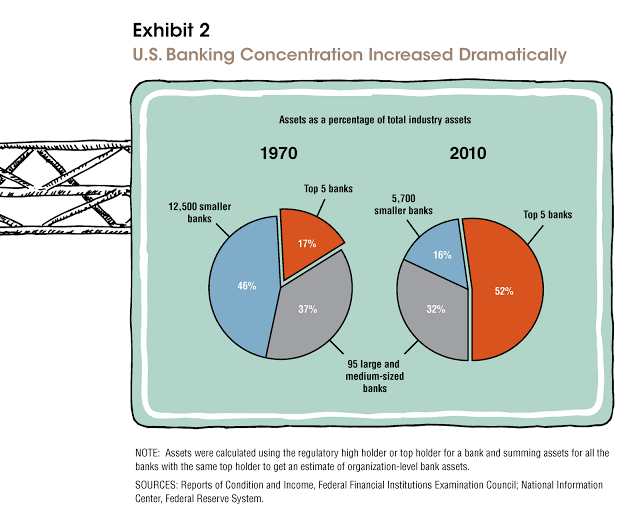 By 2010, the five largest banks controlled about 52% of financial assets, medium-sized banks held about a third, and only 16% of assets were divided among some 5,700 other banks. The chart is quite clear. Consolidation has been happening, for decades, for the benefit of the very largest banks. Which means that the bank executives who manage those top five banks get enormous salaries, bonuses, and other compensation. In 2013, CEO compensation at the four largest banks rose by 16.7%, for example, compared to 2012. So, for example, in 2013, Citigroup’s CEO made $13 million and the CEO of Wells Fargo $22.87 million. In a free market, where industry consolidation is not government policy, where open competition exists, an executive being paid $22 million a year would be unremarkable – it would simply indicate that the company highly valued that person and that the profits of the company were excellent. But in a managed industry, as heavily regulated and government-controlled as any industry in the world, executive compensation is a result of public policy. So, the consolidation of the financial industry for the direct financial benefit of those who own and operate the largest banks is current public policy. Arguably, the consolidation of the banking industry is the one objective of the bankers who conspired to create the Federal Reserve which has been achieved by the existence and operation of the Federal Reserve. One may naturally ask whether or not it is good public policy. It appears clear that the world economy is heading back into a major downturn. Copper, China, and world trade all point in the same direction. Crude oil prices appear to be dropping, again. Companies with substantial exposure to emerging markets are closing at 13-year lows. The sovereign debt crisis, which brought attention in 2009 and 2010 to unsustainable debt levels in Greece, Portugal, Italy, Ireland, and Spain is clearly not over, yet. Many other countries also have unsustainable levels of national debt, and personal and corporate debts are significant issues. In other words, the global recession that began in late 2008 has not been resolved. The structural issues that were revealed, the housing bubble (and its recent echo), the new student loan bubble, and other financial market shenanigans (credit default swaps, e.g.) paint a picture of dire economic consequences from public and financial industry policy. These are the kinds of situations that have, in the past, resulted in global wars, genocides, and tyranny. At the same time, there are a number of extremely hopeful developments. People continue to innovate against the powers that seek to centralise, pillage, and destroy people. Technologies continue to be developed that make it possible to generate new industries, new ways of living, new methods for privacy, economic freedom, and individual freedoms of every kind. One of these new technologies celebrates its seventh birthday this Hallowe’en. In 2008, Satoshi Nakamoto, almost certainly a pseudonym, published “Bitcoin: A Peer-to-Peer Electronic Cash system.” Although bitcoin clearly has many difficulties, including an enormous blockchain (now approaching 40 gigabytes), it also performs something on the order of $22 billion a year in transactions, based on the $60 million a day in transaction volume of recent weeks. Bitcoin’s limitations in the areas of user privacy and freedom from government regulation are being addressed by other innovators. Since April 2014, I’ve been working with the technology team at SilentVault.com. I continue to believe that SilentVault provides privacy, anonymity, and a secure communications platform, for users of Bitcoin, Litecoin, and silver. People deserve to have money that is free from censorship. Free markets are inherently cooperative systems. That may sound strange, since we are told, repeatedly, that free markets depend upon competition. It is competitive pressures that reduce prices, spur innovation, and encourage the development of alternatives. However, every free market must do one thing in order to be a free market: it must find market clearing prices. If people are free to find market clearing prices, they are able to produce, sell, and buy, without oversight or control. Tyranny, as Hayek noted in The Road to Serfdom always begins with interventions to attempt to control market prices. The central control over interest rates is a clear example of incipient tyranny. And how are market clearing prices found? Through the cooperation of buyers and sellers to discover prices. To be free you need understanding. Vigilance is excellent, if you know what to look for. So, to be more free, you may wish to learn more. You know, for example, that you are being watched. Domestic surveillance systems, even ones never authorised by the USAPATRIOT act, have been deployed to monitor essentially all of your communications. Therefore, you should learn how to protect your privacy. Learn, for example, about open source computer software and operating systems like Linux. Open source means that you can know what your software is doing, and so can people who are expert in writing software. Open source software allows you to protect your data, your privacy, and, therefore, your freedom, better than proprietary software which does whatever someone else wants it to do, whether you think that’s wise or not. Learn about cryptography. You don’t have to be able to find the prime number factors in a large number to be able to use encryption for your data. You simply have to know how to work with people who have already developed encrypted root hard drives, e-mail encryption, and alternative communications technologies like XMPP (eXtensible Messaging and Presence Protocol). In general, you only need to know what to look for, what to ask for, and what to install in order to have excellent results. You’ll want to spend quite a bit of time looking at the weaknesses in The Onion Router (TOR) and the advantages of a private virtual privacy network (VPN) approach to online activities. You may also wish to reduce your footprint. You might not be well off telling everyone about every thing you are doing every day. For example, every post you make to Facebook, or to Twitter, or wherever, is a record, almost certainly a permanent record, of what you are saying about what you think, what you do, what you want. Given that your friends and family are not the only ones watching, reading, and storing this information, you might choose not to create a Facebook account or choose not to log in very often, or not at all. What the future will actually look like, I don’t think anyone currently knows. But it seems very logical to suppose that the experiment in gigantic governments with unlimited powers, dictatorial tendencies, controlled by mass murdering psychopaths which was emphasised in the 19th Century through the work, wars, and policies of nationalist socialists like Lincoln and Bismark, in the 20th Century by internationalist socialists like Lenin, Stalin, Mao, and Pol Pot, and in the 21st Century by “kinder gentler” socialists like Bush and Obama has come to its inevitable conclusions. Central bankers no longer have the power to sustain the kleptocracy. Whatever it brings, you and I will see the future, and in some measure, choose to shape it. I believe you should seek to keep in touch with other people in the freedom community. I think Liberty.me is one of the very finest sites for that purpose. And, to update people on the work that I’ve begun with some of my closest friends, I’ve started a Twitter account called @digitalcashally. I would love to hear more about what you think. Together, I believe we can bring about a renaissance of freedom, innovation, and human achievement.